Well folks, Mr. Steven Samblis, CEO of IMTV has been quiet lately. However it’s been a while since he apparently needed some traveling money, and keeping true to form, surrogates took to the message boards to drum up some interest in his company’s stock. Well… looks like it may be happening again. Perhaps the wallet is feeling a little thin. Word is… another push to sell more stock shares is on. There have been several posts from new aliases on Investors Hub/IMTV apparently trying to entice others to buy the stock. However, there are longtime Samblis watchers doing their best to try and warn others of their negative experience with Mr. Samblis and his ever changing company names and tickers. 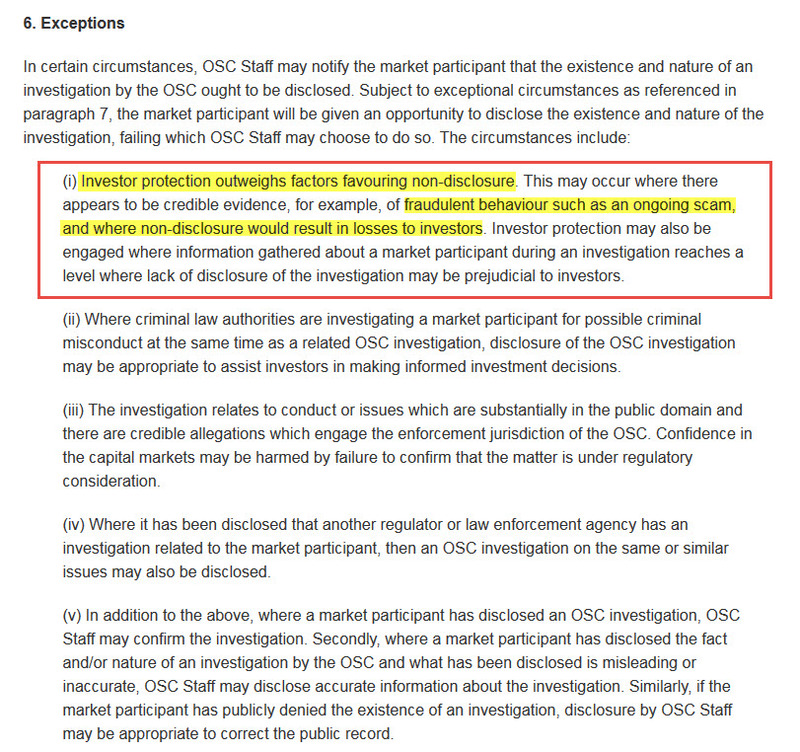 Of special interest is the highlighted section, wherein it states it’s ability to warn investors of “fraudulent behavior such as an ongoing scam, where non-disclosure would result in losses to investors“. It would be excellent if our SEC adopted the same policy, as many believe IMTV is a scam (and perhaps currently under investigation), and investors will continue to be harmed. One only needs to look at some of the recent posts, like here, and here. It seems pretty clear these are either blatant attempts at drumming up support and sales of the stock, or, these are exactly the type of investors that need protecting as mentioned in the above cited regulation. It is believed by many that IMTV exists solely to sell shares to support the lifestyle and whims of it’s CEO Mr. Steven Samblis. Many also believe any revenue generated by the advertising and sales seen on Mr. Samblis’s website is being diverted away from the public company. In spite of at least some apparent advertising dollars, the IMTV public company reports no revenue over the last several quarters. One is left to conclude that either the advertising is being given away for free, or, the revenue is going somewhere else. It is also assumed by many that whatever costs that were associated with generating said revenue, is being run through the public company. Of course this is all speculation because there are no real audit trail of the flow of cash (similar to the Clinton’s cash for favors scandal currently in the news). So, if many of the burned investors are correct, they get charged for the expenses, but the revenue goes elsewhere. Several also wonder if said revenue is being reported at all. The IRS may not look favorably on something like that. So… this is a classic buyer beware situation. As we indicated here, buying IMTV stock is easy, and the 100% swings in PPS look enticing on the surface, but buyers may have an extremely hard time selling those shares when competing with the likes of Asher, who acquired those share at [sub]pennies on the dollar. Before investing… do your DD ! Five minutes talking to Mr. Google could greatly influence your buying decision ! Previous investors can lead you to the water – but they can’t make you drink ! Which should you trust… a new alias on a message board that pops up every couple of months, or, experienced investors with years of history under their belt with this company ? Should a company finance operations with Asher ? Hello Folks… today we take a look at companies that finance their day-to-day operations, and/or perhaps their expansion plans and/or CEO compensation, with companies that provide money in exchange for shares in the company. Many companies finance their operations via banks and other conventional lenders. However some, and according to the post here, need cash so desperately, they turn to financing companies like Asher Enterprises. Here is a graphical excerpt from the referenced article, but be sure to take a few minutes and read the full article. We know Mr. Steven M. Samblis and/or his company Imagination TV, Inc. (OTC Pink: IMTV) does business with Asher Enterprises, here is the SEC filing. The questions here are… how much business has Mr. Samblis done with Asher, and of all the loans seen here, which ones would be considered “toxic” as detailed in the above referenced article. Many assume all of these listed notes would be considered toxic. Do the math on the outstanding principal amount, divided by today’s share price, and you will have some idea of the shares under contract. WOW ! WOW… how can ANY retail investor compete with that? So… investors that may be unfamiliar with the history of Mr. Samblis, and his ever-changing names of his companies, his reverse split history, his [in]abilities to generate profits (or even revenue for that matter), would be well served by doing their own research on Mr. Samblis’s historical events. 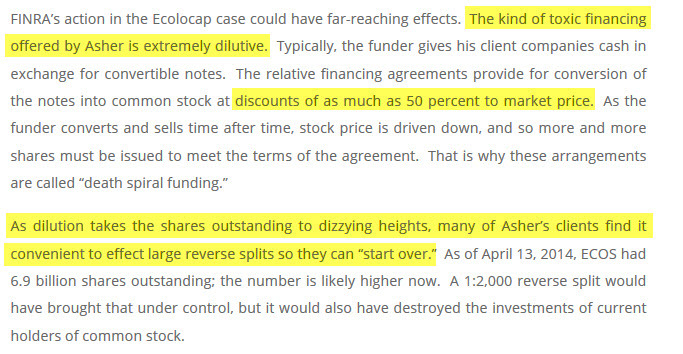 The shares are very easy to buy, and some may be tempted by the fluctuation of the PPS, but they need to understand the likely difficult time an investor will have when they attempt to sell those shares in competition with the likes of Asher who acquired their shares at a very steep discount. Of course there will be those that think they are seasoned investors, and THEY can beat the odds so to speak. Well, all we can say is… good luck. Many seasoned investors have gone before you, and have posted their experiences with Mr. Samblis in any number of investment forums. Take the time to read some… it will likely be well worth your time.